Bodhi Wood | Is "The Cup" Half Empty or Half Full? Singapore -- "The Cup" is a story inspired by true events. An unconventional film by a Buddhist director about Buddhists, it offers a glimpse into the clash of the "ancient" with the modern. Seen through the lives of young exiled Tibetan monks in India, it is a story of East meets West, of how the boys, who were supposed to have renounced the worldly, encounter and embrace the world through the microcosm of 1998's World Cup. Forget about any preachy storyline. Unflattering as it may be, this film has its feet firmly planted in the real world, with human foibles and all. You'll even see mischievous monks playing pranks and dozing during prayers. Interestingly, unlike popular depictions of Tibetan culture, the film does not make mystify it; it humanises it instead, by having the boys lighten it up on the universal human condition. Is such a movie a "cup" half full or half empty about the future of Tibetan Buddhism? It's probably just as it is - empty of any fixations. 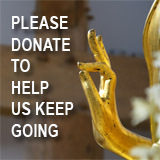 A showcase of Tibetan Buddhist culture, you'll see mandala offerings, prayer flags, mani stones, mudras, kathas... Yet you'll also see the boy monks discussing the "politics" of football. They sneak football magazines into the monastery, while sneaking out at night to watch the game. One even has a self-proclaimed "shrine" of posters dedicated to his football heroes, and suggests prayers for France to win the cup! In a humorous way, the film encapsulates the samsaric ways of the boys in their craze over the game. The game occupies their minds to the extent that they get into trouble - that's attachment. A small fight breaks out while watching a game when one of them becomes too rowdy - that's aversion. Of course, attachment and aversion arise from delusion which frets over the worldly winds of loss and gain. 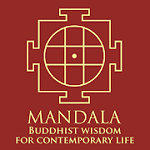 "The Cup" features human nature more than Buddha-nature, but from human natur, we can learn about Buddha-nature too. Truth is, football is intrinsically empty of any fixed characteristics. It's just a game - though it can inspire individual sportsmanship or team violence! As the curious abbot came to know of it, it's about "two civilised nations clashing over a ball". And how many more fans clash over this clash! We either play in Samsara or are played by Samsara. As long as something worthy is learnt from the game, it's probably fine. In the story, the protagonist boy monk pawns another boy's watch to raise funds for renting a TV. He realises that putting his happiness before others' could not bring him happiness. His conscience did not allow him to enjoy the final match he was craving to see, despite having put in much effort to fulfil the difficult project of getting permission to get and hook up the TV. The film is a subtle reminder to the world on the paradoxical plight of refugees - who wish to return to their homeland, versus those who wish to escape as refugees. Using football as a worldly theme in a monastery supposedly void of the worldly, the film is a playful "study" of worldly and spiritual oppression. The kindly abbot consents to the compromise that if the monks are allowed to watch the final match in the monastery, thus not needing to sneak out without permission, they will promise to behave and study better without skipping class. Is this worldly or spiritual ransom, or both? Or is the compromise a harmless skilful means to pacify boys who will be boys? You decide! An ironical story is shared in the film, which reflects the nature of Samsara - Once upon a time, a man was having a nightmare. A really scary monster approached him. "I'm going to eat you tonight." The man was terrified. He didn't know what to do, so he asked the monster, "What shall I do?" The monster replied, "How should I know? It's your dream." Indeed. The life we are living in now - this is our dream. How shall we dream on? Or rather, how shall we awake? 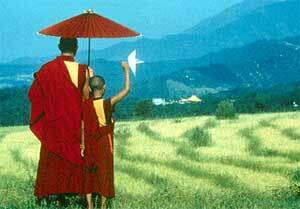 If you think the film lacked Dharma content, the abbot gives a teaching by Shantideva to the monks at the end - "Can we cover the Earth so it's soft wherever we go? No. So what can we do? Covering our feet in leather is equal to covering the earth with leather. (Great compassionate monks avoid using leather though.) Likewise, enemies are as limitless as space. All enemies cannot possibly be overcome. Yet if one can just overcome hatred, this will be equal to overcoming all enemies. All that is unsatisfactory in this world, all the fear and suffering that exists - clinging to the 'I' has created it. What am I to do with this great demon? To release myself from harm, and to free all others from their suffering, let me give myself away and love others as I love myself. If a problem can be solved, why be unhappy? And if it cannot be solved, what is the use of being unhappy?" Simple yet wonderful advice. You don't even need to be a Buddhist to appreciate its wisdom!